It’s been two years since I last updated this site. Yes. I’ve been busy. I have moved on from the netbooks and all the tech of 2014. I’ve traveled a bit since then, worked way too much, and spent not enough time writing. So let’s catch up a little. The tech I’m rocking right now. Desktop: Dell XPS 8700 Core i7 4770 with a GTX 950, Intel Core i5 5th gen.
I’m probably missing a few things but that is most of the new tech I’m rocking. The 4K TV as a computer display is probably the best things I’ve installed so far. Forget the multiple displays. A few things you should know before deciding to use a 4K TV as a monitor. Make sure your 4K TV has a display port or has HDMI 2.0. Make sure your computer has a display port or can output HDMI 2.0. That’s why I upgraded to a Nvidia GeForce GTX 950 for the HDMI 2.0 output. I believe all Samsung 4K UltraHD TVs come with HDMI 2.0 but please verify before you buy. Disclaimer: These are products that I use and the opinions on this site are my own. I have affiliate links on this site. This entry was posted in Uncategorized on July 31, 2016 by Chief Monkey. I wanted to get the SiliconeDust HD Homerun Prime Tuner for a long time. 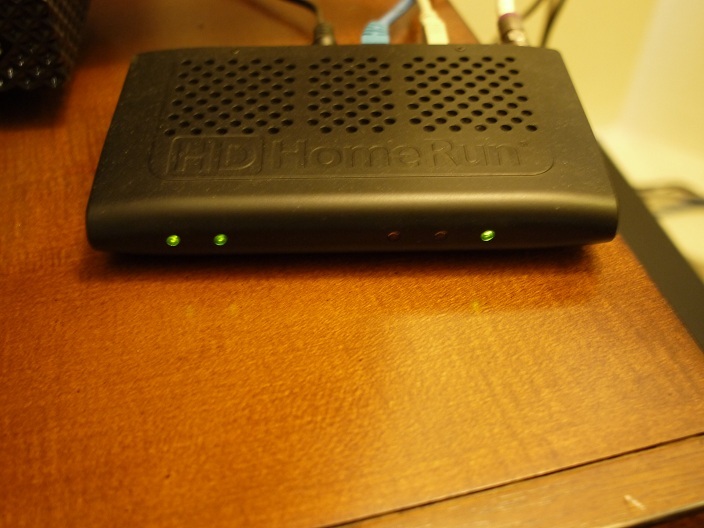 The HD Homerun Prime is like a cable box but for your home network. It enables you to watch TV on a computer, tablet, or phone connected that are connected to your network. The tuner is able to produce 3 separate streams to 3 devices. This means that 3 devices on the network can watch and change channels independently of each other. It takes a little tinkering and patience to get everything set up and configured. It’s all worth it in my opinion. The HD Homerun Prime can replace your cable box if you have a home theater PC (HTPC) connected to your TV. For me, Charter Communications charges $6 a month to rent each cable box. The cable card costs $2 a month. The price will vary depending on your cable provider. THe HD Homerun Prime costs $150. But you can get it for $100 when it goes on sale. There are some good 3rd party apps for your tablet or smartphone. I use the HomerunTV app, which costs $2.99, for my Nexus 7 tablet. The app are a little buggy but works well once you have everything configured. Overall, it’s worth the time and effort to get this running. Any device connected to your network could be a TV. Let me give you a few warnings about setting it up and using it. You will have to become a CableCard expert whether you like it or not. When you call the cable company, 99% of the representatives will not know anything about the cable card or now to troubleshoot. Most of the time, I’m guiding a representative through their system when something goes wrong. I’m going to breakdown the setup process into 3 parts; hardware, installation, and cable company. Obtain a CableCard M-Card from your cable company. You’ll also need something called a tuning adapter. Most of the cable reps don’t know. Just ask them for the box that goes with the cable card. It looks like a cable box. You’ll also need a PC and the HD Homerun Prime. I’m also assuming you have a home network too. You need a high performance home network to accomodate the bandwidth needed to stream 3 unique HDTV sources. I have a wired gigabit (10/100/1000) network and a wireless N router. It has to be gigabit and wireless N for a clear signal. I made sure to connect my dedicated HTPC to the wired network to make sure I get the best signal possible. Wireless N is just fine when I watch HDTV on my Nexus 7 tablet. There are many guides about setting up an HTPC. 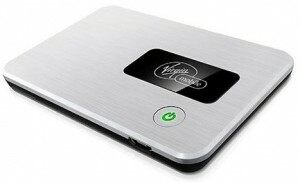 You have your choice of operating systems and different options of media players. I went with the simplest way possible. I used Windows Media Center on a Windows 7 desktop. Windows 8 doesn’t come with Media Center. It’s a downloadable paid app from the app store. Windows 8 Pro does come with Media Center. So check your computer before doing this. Windows Media Center (WMC) is fully capable of being your DVR. It downloads a guide for you to schedule all recordings. The first thing you need to do is install the HD Homerun driver and software. In WMC, you need to install the “Digital Cable Advisor” found in the Extra menu. You can’t watch most digital cable channels with the Digital Cable Advisor. It makes sure that your recorded show can only be watched on your that computer. I’m going to assume you’ll have an extra coaxial cable lead from a splitter. You might need to get a cable guy to come to your house to set up an extra outlet. 1. Tuning apater – 3 wires; coaxial in (from the cable company), coaxial out to the HD Homerun Prime, and usb cord. 2. 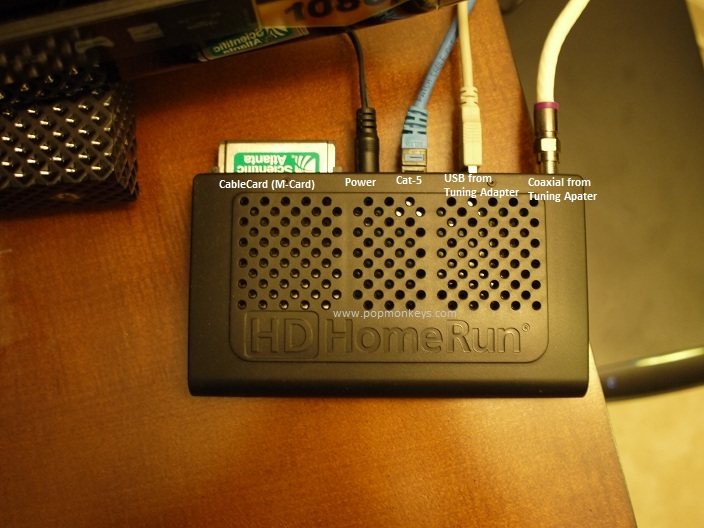 HD Homerun Prime – 3 wires and cable card; stick the cable card into the slot, connect the coaxial from the tuning adapter, connect the usb cord from the tuning adapter, connect the cat-5 network cable to your network. In WMC, go to Settings> TV> Set up TV Signal. WMC will scan for any available tuners. WMC will give you a screen of different numbers from the tuner. Now it’s time to call the cable company. Call your cable company and tell them you want to set up a cable card. They’ll ping your cablecard to make sure they can see it on their network. Ask them if you can give them a Host ID. This is important. Without the Host ID, nothing will work. After you they enter the Host ID, you should be all set with the cable company. Now scan for channels again. With WMC, you need a free plugin application called, Digital Cable Advisor. It’s available in your Extra menu. It’s basically for copyright purposes. Some TV shows are locked to that one PC only. That means you can only watch the recorded show on the PC that recorded it. It’s important that you never shut down your PC if you schedule a recording. Instead, set the PC to sleep after 30 minutes of inactivity. That’s about it. I’m sure I’m missing some minor details. It’s been a while since I set this up. This entry was posted in DIY, how to, TV on August 24, 2014 by Chief Monkey. The concept is simple. I just want to block annoying callers like telemarketers. The feature didn’t exist a few years ago. I finally found it on Verizon. However, I could only block 25 callers. I think they designed it for failed relationship instead of persistent calls from telemarketers or collection agencies. I thought it would be simple for and iPhone to handle a task like that. Nope. I was wrong. I finally found it on the Samsung Galaxy S4. It’s a feature built right into the phone. The feature is located in your phone app -> (hit the menu button) call settings -> Call rejection. The S4 will store a list of numbers to reject. The phone will not ring if you receive a call from these numbers, but will go to voicemail instead. It’s not perfect, but it’s one step in the right direction. This entry was posted in Cell phone, how to and tagged Samsung Galaxy S4 on September 10, 2013 by Chief Monkey. One of the more unique features of the Samsung Galaxy S4 is the inferred sensor at the top. The built in Watchon app and IR sensor makes the S4 a pretty useful universal remote. You can set up individual rooms. The code base is pretty extensive. The app had no trouble finding the code for a very old Viewsonic TV in my bedroom. The app also makes recommendations for you based on what you like. It also can show you HD channels only. This entry was posted in Cell phone and tagged Galaxy S4, Samsung on September 3, 2013 by Chief Monkey. I was scratching my head I discovered my playlists disappeared on my Samsung Galaxy S4. I wasn’t used to the quirks of my S4 yet because I only had it for a few days. The strange part was that I was listening to one of them. To correct this problem, you just need to update your library. I store all of my music on an external micro SD card. I added a few files the night before by connecting the phone via USB cord. Once you updated the library, the playlist should be restored. This entry was posted in Cell phone, how to and tagged Android, Galaxy, Playlist, S4, Samsung on September 2, 2013 by Chief Monkey. I outgrew the Canon EOS 50D. I needed a more advance camera to continue to learn and make shooting a little easier. Enter the Canon EOS 5D Mark III. I bought the kit which comes with the Canon 24-105mm f4L IS. This is a beast of a camera. Now I can record video on the camera with a push of a button. The 50D doesn’t record video. More importantly, the autofocus on this camera is simply amazing. I went from 9 AF points to 63. It took me some time to get used to all the advance settings and using the camera. It’s very different from my old 50D. However, it’s just so much more advance in every aspect. When I was research a new camera, I was seriously considering the Canon 7D as well. I went with the 5D Mark III because of the full frame sensor. It’s better at taking pictures in low light than a crop sensor. If I had a bunch of EF-S lenses, I probably would have gone with the 7D or wait for the rumored 7D Mark II. Most of my lenses were EF, so I was good to go. Overall, I’m pretty happy with my purchase. It’s not a cheap camera by any means, but you do get a lot of performance in a well rounded package. No, there’s no pop-up flash, but you can always edit the photos in post production to make up for it. This entry was posted in Digital Camera, DSLR on March 11, 2013 by Chief Monkey. This lens is legendary. All the pros and semi-pro photographer have one. This is a big and heavy lens to use and carry around. It’s also one of the best lens to use because of the 2.8 aperture. The bokeh is buttery smooth. I still have a love hate relationship with this lens. First of all, this is an awkward lens. There are a lot of bad copies out there. The problem was that it either back focused or produced really soft images. The lens also reverse zooms. The lens extends at wider angles. When I use autofocus on a 50D and a 5D mark 3, it’s hit or miss. Sometimes I would get good sharp images. Other times, it’s a blurry mess. I would say it’s 50/50. Manual focus is a different story. This lens need to be manual focused. Unfortunately, the original version of this lens has been discontinued by Canon. There is a newer version out that corrects a lot of the flaws. It’s also slightly lighter and smaller. Only slightly though. The big barrier to the average consumer is that this lens costs $2300. For that kind of change, I would rather get the 70-200mm f2.8 II. This entry was posted in Digital Camera, DSLR on December 11, 2012 by Chief Monkey. Is a Smart TV Worth It? A new big screen LED TV is nice. However, it seems that the manufacturers have wised up on how to market this “new and improved” TV to consumers. The formula is simple. Take an LED TV, add wifi, add some apps, and charge people about $600 more. I’m in the market for a TV right now, but I’m not looking for a Smart TV, other wise known as a connected TV. I just want a “dumb” LED TV that’s…a good TV. It doesn’t need to be smart. I have no desire for the TV to use apps. More about that later. The reason why I want a “dumb” TV is because I plan to use a small nettop or old laptop computer as the media center. A nettop computer will cost about $400 but will have infinite more uses over the Smart TV’s features. Smart TVs are nice and provide some convenient features. Most have Netflix and Youtube apps already out of the box. However, some of the app features are limited. For example, on some TVs, the Netflix app can only play movies from a playlist that you have created on a computer. Some TVs can play video files from a USB flash drive, but it can’t play all types of files. In my opinion, I don’t think it’s worth the extra money for a Smart TV. You’ll be paying an extra $500 – 1000. For that amount of money, I can easily get a pretty good computer hooked up to the TV while saving $300 – 400. In general, the Samsung UN46EH6000 fits my needs. Here’s an Amazon.com product link. This entry was posted in TV on October 22, 2012 by Chief Monkey. I haven’t been posting on this blog. Yes, I still own it. It’s facing an identity crisis. When I first started this site, I was focused on a wide range of technology. After a few years, that all came to a grinding halt because I was not looking into new computer parts or upgrades. Lately, my passion for technology has moved to photography. I’ve been investing into my camera equipment more than my computers. I think it’s time to start clean with the declaration that this blog is for me now. It probably will include tech, cameras, food, and everything else that goes on in my world. This entry was posted in Uncategorized on July 2, 2012 by Chief Monkey. The next phase. While attempting to write and review stuff, life has a nasty habit of getting in the way. It’s not easy to blog and keep a 9 to 5. Well, it’s actually more like a 7 to 6. So, I’m changing life a little bit to allow more time to focus on the fun part of life and less on the 9 to 5. It’s going to be a busy 3 weeks. However, there is a long list of new products that I will be getting to review and use. For now, I’ve been using the 70-300mm f4-5.6L IS more lately. Many people are questioning this lens and whether it’s a good buy. It is. First of all, it’s very compact. I travel a lot, so packing light is essential. Second, it’s doesn’t include a tripod collar. Yes, that’s true. FYI, it’s doesn’t need one. It’s light enough to hand hold and has IS to take care of any jitters. Third, it’s sharp, really sharp. And finally, 300mm on a 1.6 crop sensor means I’m getting 480mm of focal length. This entry was posted in Digital Camera, DSLR and tagged 70-300mm, Canon, Canon L on May 14, 2011 by Chief Monkey. I need to make it a habit to write regularly. I’ve been a little anti-sharing lately. I’ve been focusing more on the camera than the tech equipment. So the direction of Popmonkeys.com will shift towards camera and camera gear. Of course, I’ll write about tech from time to time. So, what have I been up to? Well, my trusty Canon EOS 50D is finally getting some serious upgrades. I made the switch to L lenses for most of my pictures. 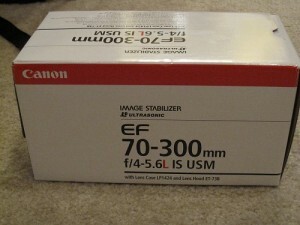 I picked up the Canon 70-300 mm f4-5.6L IS in January. I also added the Canon 24-70 mm f2.8L. I considered long and hard between the 24-70mm f2.8L and the 24-105mm f4L IS. The 24-105mm f4L does offer a more usable focal length. However, I mostly shoot handheld in low light. So the f2.8 was the winner. Both lenses are spectacular. If you don’t need the f2.8, go with the 24-105 because it’s $300 cheaper, has IS, and gives you 30mm more to play with. The 50D crop 1.6x sensor is the perfect match the for the 70-300mm telephoto zoom. This combination yields an impressive 480mm zoom. I am thinking about upgrading the camera body to something with more features. I’ll be taking a long hard look at the upcoming 5D Mark III. 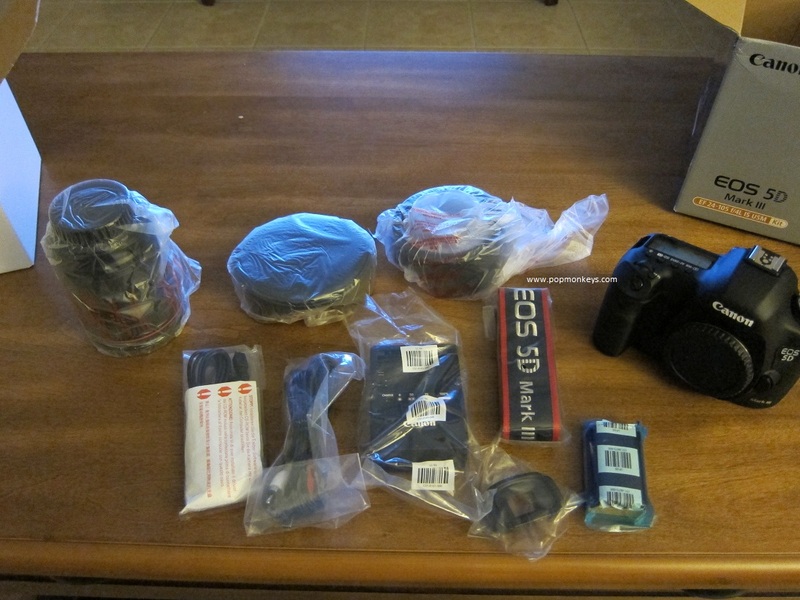 This entry was posted in Digital Camera and tagged 50D, 5D, 5DM3, Canon, DSLR, Mark 3 on March 29, 2011 by Chief Monkey. It’s been such a long time since I posted anything, and there is so much to talk about. Lately, the computers are staying the same, but the camera is getting some much needed upgrade. 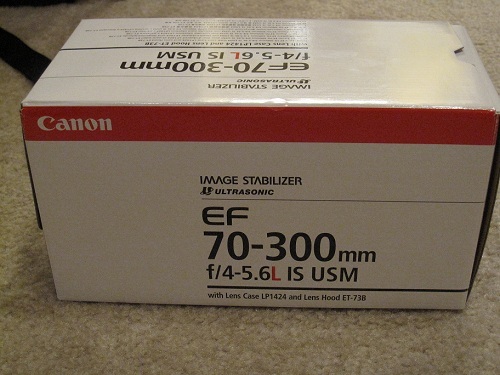 My latest purchase is the Canon EF 70-300mm f/4-5.6L IS USM. I travel with my camera a lot. I care about image quality but wanted something compact. The new L-series 70-300mm was perfect. The AF is very quick and locks the instant you press down on the shutter button. As with any L lens, the build quality is just solid. I’ll post some sample pics and a full review later. This entry was posted in Digital Camera and tagged Canon, lens on January 13, 2011 by Chief Monkey. In keeping with gadgets and technology, I’ve forgotten how pleasant it is when something is simple. Technology is supposed to make our lives simpler, but it seems to do the opposite most of the time. Virgin Mobile recently announced a prepaid unlimited data plan that takes advantage of the Sprint 3G network. The only downside is that you have to make the initial investment of $150 for the Mifi 2200 card. You can connect up to 5 devices to the Mifi card with wifi. The battery life of the Mifi card is claimed to last 4.5 hours with one connected device. Packaged with the Mifi card is a micro USB charger and cable. Set up was a breeze. You have the option of paying by credit card or purchasing Virgin Mobile Top Up cards. It’s basically a prepaid card that you can purchase at major retail outlets. $40 will give you unlimited data for a month. After the month is up, you can add more funds to activate another month or activate it whenever you like. You can stop and start service whenever you like. On a recent business trip, I found out that the card will not charge via USB cable. It has to be connected to a wall charger. Lucky for me, the hotel loaned me a charger for the duration of my stay. It also heats up when in use. There is no credit check, no credit card required, no activation fee, monthly bills, or costly accidental overages. That’s a big plus in my book. The speed will vary depending on how close you are to the Sprint cell towers. Never have I been delighted by the simplicity of signing up for the Virgin Mobile Broadband2Go. It’s really easy. It works, and the fine print is kept to a minimum. You could spend $80 and purchase the USB modem instead. However, you can only connect one computer to it at a time. Since the announcement of the new unlimited plan, the Mifi 2200 card are hard to find because of its popularity. Major retailers such as Best Buy and Wal-Mart are having trouble keeping it in stock. I highly recommend this product and service. This entry was posted in Uncategorized on September 26, 2010 by Chief Monkey. If I could only bring two things with me when I travel, it would be the iPod touch and Audio-Technica’s ATH-ANC3 QuietPoint Active Noise-Canceling In-Ear Headphones. 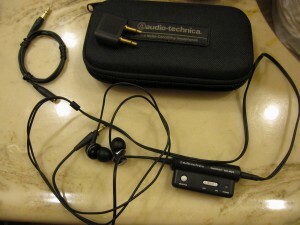 The Audio Technica ATH-ANC3 ear buds does a great job at canceling 80% of the ambient noise around you. As for the other 20%, whatever you’re listening to should take care of that. I brought these along with my trip to China. They dramatically cut down the engine noise on the plane while producing great sound quality. Best of all, it’s not that expensive. The unit comes with a carrying case, 0.5 meter extension cable, airplane audio adapter, and different size ear cups. The airplane adapter comes in handy for viewing in-flight movies without having to use the sucky supplied headphones. The unit is powered by one AAA battery and is good for about 40 hours of use. The control/battery unit has an on/off switch and a monitor button. When pressed and held down, the monitor button will bypass the noise cancellation if you need to. That is a nice feature for me when I needed to talk to a flight attendant. They’re ear buds. You don’t have to carry these ginormous headphones to get get great audio quality. I used to carry around a set of Sennheiser HD280. They were big, clunky, and took up too much room. I love how the Audio Technica were so easy to pack and carry. Believe it or not, these are about $60. They are well worth the money for what they do and how well they pack. Of course, here’s an Amazon.com product link. This entry was posted in portable audio, Review and tagged audio, audio technica, ear buds, headphones, noise canceling on September 13, 2010 by Chief Monkey. Yes, Popmonkeys.com has been left alone for a while. In my absence, there has been a lot of new gadgets that have hit the market. The iPad is making the tablet segment cool. It’s effectively squeezing out the small netbooks. However, I still think there’s a market for the 12 inch netbooks. I’m discovering that having a media player can essentially replace a HTPC, Home Theater PC. More on that later. Comment spam has been taking over this blog. I haven’t published any comments because it’s all spam. It’s bad. That’s all the updates for now. I look forward to posting more. This entry was posted in Uncategorized on July 10, 2010 by Chief Monkey. Due to an overwhelming amount of comment spam, I am forced to turn off comments for now. Sorry for the inconvenience. This entry was posted in Uncategorized on June 25, 2010 by Chief Monkey. Do you own a Nokia E71? Has the battery been acting up lately? Does it barely make it through the day before you need to plug it in? My E71 has been going through that. The battery barely lasts a day. Changing the battery will result in the same problem. I toyed with the idea of sending the phone to Nokia for them to take a look. However, that didn’t quite sit well with me because they’ll always send it back with another issue. Recently, I went out of the country for 3 weeks and didn’t need my phone. I just let it sit at home so that the battery could complete discharge. When I got home, I plugged it in and charged the battery overnight. Now, the phone will go about 4-5 days, depending on usage, per charge. 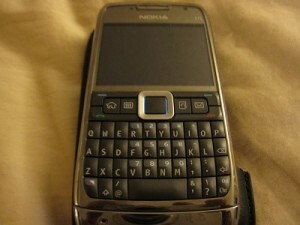 This entry was posted in Cell phone and tagged Battery, Drain, E71, Nokia, Unlocked on June 11, 2010 by Chief Monkey. On my recent three week trip, I chose the Lowepro Versapack 200AW because it combines a camera bag and a backpack. Like it’s name, it’s pretty versatile. 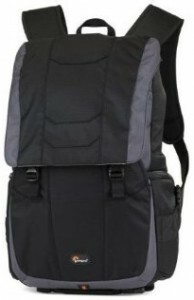 The backpack is split into two sections. The bottom section is a dedicated for your DSLR. There was plenty of space for my Canon EOS 50D with the 28-135mm lens. However, if you have a lens that’s a bit larger, say the Canon 70-200mm, it’s going to be a tight fit. You can access your camera from the side, which is very handy to swing the pack around and pull out your camera. There is enough room to store a point and shoot camera and a small lens on the other side. The top section of the pack offers a nice space to carry random things while you’re out and about. I mostly carried sunscreen, a bottle of water, my iPod, and my BlackRapid strap. The pack is designed not to be protruding like most camera backpacks. it’s pretty slim and curved to contour your back. There’s even a nice deep security pocket to store travel documents. I wished the backpack came with side pockets to store water bottles on the outside. Sure, you can buy add Lowepro’s SlipLock accessories, but that cost extra. The top section has to be zipped up all the time or else the contents will spill out. The shape of the opening of the top section also makes it a little difficult to zip up. Overall, I would recommend this product because it’s the combination of both worlds. You can pick this up at Amazon for about $100. Click here to view the product page. This entry was posted in Digital Camera and tagged backpack, lowepro, Review, versapack on June 5, 2010 by Chief Monkey. I love it when a gadget does more than just one thing. This is especially nice and important when traveling. When I’m traveling, I’m looking to pack light while getting all my needs met. For me, I’m turned to the Apple iPod Touch for my upcoming trip to China. When people hear iPod, they think music player. Yes, the it can do that, but it can do a lot more. I needed something that can surf the web and do emails without the bulk of a laptop. Sure, I could bring my netbook, but that’s 4 pounds of extra weight in my backpack. In addition, the iPod also takes notes, keeps time in multiple time zones, tracks my itinerary, and more. Oh yes, it also plays music and video for the long plane ride. I’m not an Apple fan, but I have to admit it when they make a good product. I wished it had a camera. There are rumors that the next iPod Touch will have a camera. I call it the Swiss Army Knife of gadgets. You can pick his up at Amazon.com for about $270 + Free Shipping. 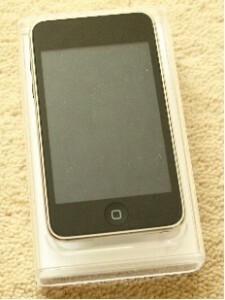 This entry was posted in Review and tagged 32GB, Apple, iPod, Touch on May 2, 2010 by Chief Monkey.